When it Comes to Our Tender, Juicy BBQ, Famous Dave’s DMV Pitmasters Wake Up Early to Smoke it to Perfection. We serve up award-winning BBQ in a family-friendly setting that is sure to get your mouth watering! We’ve yet to meet someone that was able to resist our juicy St. Louis-style ribs, country-roasted chicken, Texas beef brisket, and, of course, our sides made from scratch. 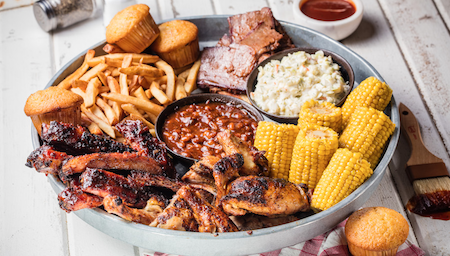 You’ve got to try our All American BBQ Feast® – it’s served up on our traditional garbage can lid platter and full to the brim with amazing, fall-off-the-bone Southern cookin’! Anyone of our smokin’ starters can be a meal in itself. All the appetizers you’d expect from a family style restaurant and a few unique to BBQ. Not sure where to start? 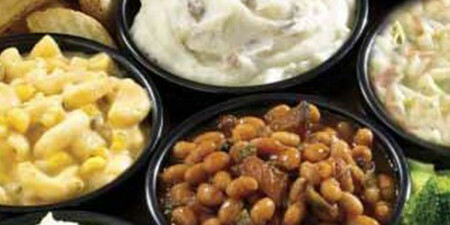 Try Dave’s Sampler Platter. There is something for everyone! (1030 Cal.) Smoked pork, flash-fried and griddled in blackberry BBQ sauce. Topped with candied peppers and served with Onion Strings. (920 Cal.) Tender pieces of Texas Beef Brisket seared and caramelized with Sweet & Zesty® BBQ sauce. (2550-3200 Cal.) Southside Rib Tips, Chicken Tenders, Sweetwater Catfish Fingers, Onion Strings and Traditional or Boneless Wings tossed in your choice of sauce. (670 Cal.) Served with Jalapeño Sweet & Sour Sauce. (760 Cal.) Breaded with Cajun-seasoned cornmeal and flash-fried. Served with rémoulade and Jalapeño Sweet & Sour sauces. (1450 Cal.) A pound of Memphis-style, dry-rubbed tips served with a side of jalapeño pickled red onions, spicy Hell-Fire Pickles and our Southside BBQ sauce. (1290-1410 Cal.) Crisp tortilla chips topped with house-smoked cheddar cheese sauce, Dave's Award-Winning Chili and your choice of Texas Beef Brisket, Georgia Chopped Pork or BBQ Pulled Chicken. Garnished with lettuce, tomato, jalapeños, seasoned sour cream and Rich & Sassy®. (1260 Cal.) Served with Dave's Ranch & Sassy sauce. (1940 Cal.) Lightly-breaded and flash-fried, served with rémoulade sauce. (780 Cal.) Hickory-smoked salmon, cream cheese, capers and chipotle peppers, served with fire-grilled pita bread. Choice of grilled chicken breast or BBQ pulled chicken. Tossed with cilantro, cheddar cheese, tomatoes, roasted corn, black beans, tortilla strips and lime chipotle ranch dressing then drizzled with Rich & Sassy ®. Served with a Corn Bread Muffin. 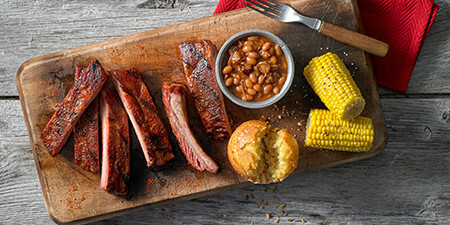 Our St. Louis-style ribs are hand-rubbed with seasonings, smoked “low and slow” for hours and finished on the grill for lip-smackin’, bone-sucking, award-winning flavor. Slather them in your favorite sauce or eat ‘em bare naked. Add a cup of soup (260 Cal. ), chili (380 Cal. ), side salad (320 Cal**) or loaded baked potato (730 Cal.) for $3.49. (1200-1540 Cal. *) Create your own slab by pairing up any two different half slabs. When you can’t decide what to order, take home one of our Famous Feasts! We’ve combined DMV's favorite meats and sides to make meals for 2 to 6 people. (2260/2430 Cal.) Dave's favorite meal. Georgia Chopped Pork, 1/4 Country-Roasted, Barbecue Chicken, 3 St. Louis-Style Spareribs, Sweet Corn, Wilbur Beans, Creamy Coleslaw, Famous Fries and a Corn Bread Muffin. (7480/7520 Calories. 1870/1880 calories per person for 4 people.) A full slab of St. Louis-Style Spareribs, a whole Country-Roasted Chicken, half pound of either Texas Beef Brisket or Georgia Chopped Pork, Creamy Coleslaw, Famous Fries, Wilbur Beans, six pieces of Sweet Corn and four Corn Bread Muffins. Served family-style for 4-6 people. (4170/4450 Cal. - 2085/2250 Cal. per person for 2 people) All flavor of our All-American BBQ Feast served family-style for 2-3 people. That’s right, Famous Dave’s has genuine Pitmasters slow-smoking and grilling our meats to perfection. We have everything you’ll find at a true Southern barbeque- from chicken, ribs and hot links to pulled pork, pulled chicken and brisket. Add a cup of soup (260 Cal. ), chili (380 Cal.) side salad (320 Cal.) or loaded baked potato (730 Cal.) for $3.49. Add an extra meat (330-680 Cal.) for $3.99. (970 Cal. *) Smoked pork, flash-fried and griddled in blackberry BBQ sauce. Topped with delicious candied peppers. (870 Cal. *) Smoked for up to 12 hours and chopped to order. (790 Cal. *)Rubbed with a blend of Dave's secret spices, coarse black pepper and a hint of brown sugar, then slow-smoked over hickory 'til it's juicy and tender. (1450 Cal. *) A pound of Memphis-style, dry-rubbed tips. Served with a side of jalapeño pickled red onions, spicy Hell-Fire Pickles and our Southside BBQ sauce. (220 Cal. *) Grilled, glazed and caramelized on a smoldering cedar plank. (650 Cal. *) Specially-seasoned 1/2 chicken, roasted and char-grilled to perfection. (700 Cal. 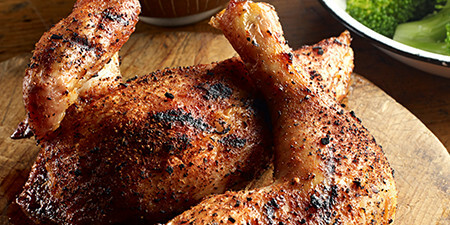 *) Country-Roasted Chicken flame-kissed and slathered with Rich & Sassy®. (830 Cal. *) Tender strips lightly-breaded with Cajun-seasoned cornmeal and flash-fried. Served with rémoulade and Jalapeño Sweet & Sour sauces. (720 Cal. *) Twelve ounces of hot link sausage. Best served with an ice-cold beer to douse the flames. Available ONLY on Sundays! Four pieces of Famously Fried Chicken served with choice of two sides, a Corn Bread Muffin and Buffalo Honey sauce on the side. (1030-1070 Cal. *) Dave's wings specially-seasoned and tossed in your choice of sauce: Rich & Sassy®, Buffalo, Pineapple Rage®, Devil's Spit® or Wilbur's Revenge®. (9240 Cal.) Five pounds of tips and two pounds of Famous Fries. Serves 4-6. Does not include Corn Bread Muffin or choice of sides. (1270 Cal. *) Tender pieces of Texas Beef Brisket seared and caramelized with Sweet & Zesty® BBQ sauce. (720 Cal. *) Tossed in Dave's special seasoning and served with Jalapeño Sweet & Sour sauce. Why limit yourself to just one of our award-winning meats? 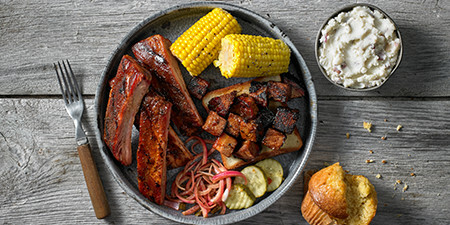 At Famous Dave’s we make it easy to satisfy your BBQ craving by giving you options. Pick two of your favorites or pair one with our Pitmaster’s choice of meat. Meat Selection Includes: Georgia Chopped Pork, Texas Beef Brisket, Southside Rib Tips, Country Roasted Chicken, BBQ Chicken, Chicken Tenders, Sweetwater Catfish Fingers, Traditional or Boneless Wings and Hot Link Sausage. Add a cup of soup (260 Cal. ), chili (380 Cal. ), side salad (320 Cal. **) or loaded baked potato (730 Cal.) for $3.49. (960-1750 Cal. *) A 1/3 slab of our award-winning St. Louis-Style Spareribs, plus your choice of any one meat selection. (1200 Cal. *) Burnt Ends paired with 4 Bones of St. Louis-style Spareribs. (680-1860 Cal. 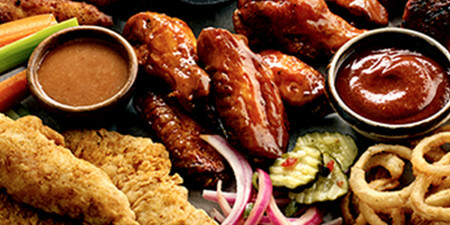 *) Double your pleasure with any two different meat selections, excluding ribs. (920-1730 Cal. *) A 1/2 slab of baby backs and choice of any one meat selection. We make DMV's favorite sides every day, from scratch. They are the perfect pairing for any of our BBQ meats and just the right portion to satisfy. (180 Cal.) Baked beans loaded with smoked pork, brisket, hot link sausage and jalapeño peppers. (130 Cal.) Buttery, sweet corn-on-the-cob. (100 Cal.) Red-skin potatoes mixed with milk, butter and garlic. (130 Cal.) Potatoes with red onion, celery, hard-cooked egg, mayonnaise and a hint of mustard. (70 Cal.) Simply-seasoned to bring out its natural flavor and tenderness. (200 Cal.) A zesty slaw that's pineapple sweet with a hint of horseradish. (350 Cal.) Crispy-fried, classic cut, skin-on Famous French Fries. (150 Cal.) Our homestyle version blended with four cheeses, corn and a jalapeño kick. (160 Cal.) Dave's Collard Greens cooked with onion, garlic, bacon and hot link sausage, with a touch of southern hot sauce. (90 Cal.) Two big, juicy slices grilled and seasoned with cayenne and raw cane sugar for a touch of sweet heat. Our burgers are made fresh to order. That’s how we do it here at Famous Dave’s. Only the best meat, seasoned and grilled on-site. If you are looking for the best burger DMV has to offer, you’ve found it here at Famous Dave’s in DMV. (590 Cal.) Start with a burger patty and choose from the following add-ons. 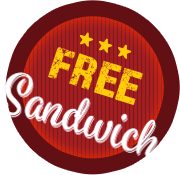 FREE ADDS (5-100 Cal.) Lettuce, tomato, red onion, jalapeños, spicy Hell Fire Pickles, Rich & Sassy®, Sweet & Zesty®, Devil's Spit®. +$0.49 Each (160-340 Cal.) Cheese: American, Monterey Jack, smoked cheddar, pepper-Jack, Bleu cheese crumbles. +$0.99 Each (50-420 Cal.) Memphis-Style, Onion Strings, Dave's Cheesy Mac & Cheese, bacon, jalapeño bacon. (850 Cal.) Slathered with Rich & Sassy® then topped with melted Monterey Jack cheese and two strips of bacon. (880 Cal.) Slathered with Devil's Spit® BBQ sauce and topped with melted pepper-Jack cheese, jalapeño bacon and spicy Hell-Fire Pickles. (1020 Cal.) Piled high with Georgia Chopped Pork and two strips of jalapeño bacon, melted sharp American cheese and our signature Beam & Cola BBQ sauce. Juicy tender barbequed chicken, pork or brisket, piled high and served on a fresh bun. Our hearty sandwiches are the perfect portion- not too big for lunch, not too small for dinner. (1000 Cal.) Smoked pork, flash-fried and griddled in blackberry BBQ sauce, finished with candied peppers. (960 Cal.) 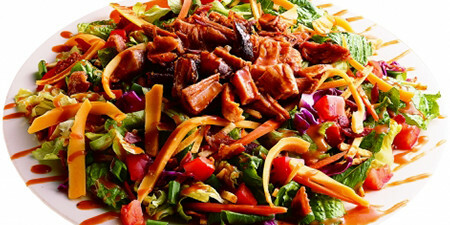 Award-winning, slow-smoked chopped pork topped with Rich & Sassy®. (640 Cal.) Piled high with hand-seasoned, hickory-smoked Texas Beef Brisket. (640 Cal.) Roasted, pulled chicken tossed in Rich & Sassy® and topped with melted Monterey Jack cheese. (700 Cal.) Tender pieces of Texas Beef Brisket seared and caramelized with Sweet & Zesty® BBQ sauce. (780/790 Cal.) Choice of Texas Beef Brisket or Georgia Chopped Pork piled high with Hot Link Sausage and topped with Hell-Fire Pickles. (680 Cal.) Grilled chicken breast topped with Monterey Jack cheese and two strips of bacon. (1250 Cal.) Grilled chicken breast with pepper-Jack cheese and fried Onion Strings, topped with rémoulade sauce. (430 Cal.) A tender chicken breast grilled to perfection. Smaller portions of our same amazing meats and sides. 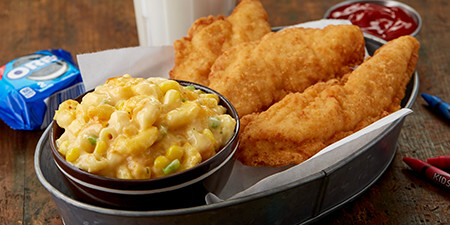 If your Lil’ Wilbur hasn’t developed a taste for BBQ, we gladly offer traditional kid-fare foods like chicken tenders and corn dogs. Add an ice cream sundae (270 Cal.) or kids root beer float (210 Cal.) for $1.99. 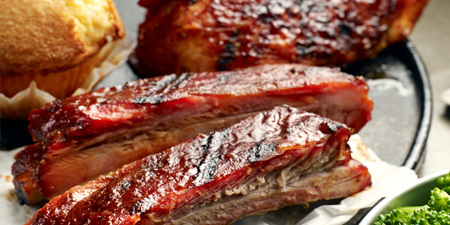 Enjoy some mouth-watering BBQ any time of the day. Ideal for carry-out or dine-in, these afternoon deals are served daily from 11:00 am until 5:00pm. Meet your family or friends for a mid-day meal or take some back to work. We can accommodate your busy schedule. Served with choice of one side (see sides for nutritional information) and a Corn Bread Muffin (260 Cal). Meat Selections: St. Louis-Style Spareribs, Georgia Chopped Pork, Texas Beef Brisket, Southside Rib Tips, Country-Roasted Chicken, Barbeque Chicken, Chicken Tenders, Sweetwater Catfish Fingers, Traditional or Boneless Wings, Hot Link Sausage. (730 Cal. *) Baked potato topped with house-smoked cheddar cheese, bacon, sour cream and whipped butter. (760 Cal. *) Baked potato topped with tender, fresh broccoli, smoked cheddar cheese sauce, bacon, sour cream and whipped butter. (790-860 Cal. *) Baked potato topped with your choice of: Georgia Chopped Pork, Barbeque Pulled Chicken or Texas Beef Brisket with house-smoked cheddar cheese, bacon, sour cream and whipped butter. (670-1140 Cal. *) Pick two of the following: Dave's Award-Winning Chili or Soup, Side Salad (Fresh Garden or Caesar), or Loaded Baked Potato. Served with lettuce and tomato, choice of one side (see sides for nutritional information) and spicy Hell-Fire Pickles. (890 Cal.) 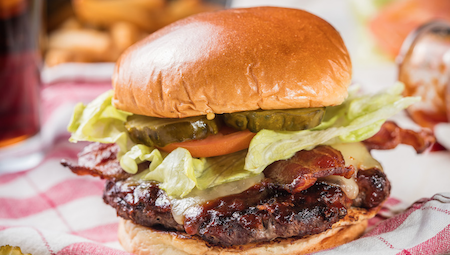 Two quarter-pound, all-beef patties topped with Monterey Jack cheese, bacon and Rich & Sassy®. Served with lettuce and tomato, choice of one side and spicy Hell-Fire Pickles. (760 Cal.) Two quarter-pound, all-beef patties topped with choice of cheese. Served with lettuce and tomato, choice of one side and spicy Hell-Fire Pickles. Served with choice of one side (see sides for nutritional information) and spicy Hell-Fire Pickles. Try it "Memphis-Style" (50 Cal.) and we'll top your ' que sandwich with creamy coleslaw for just $0.99. (610 Cal.) 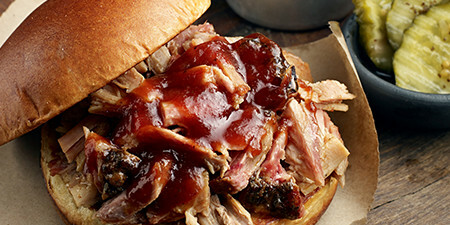 Award-winning, slow-smoked chopped pork topped with Rich & Sassy®. (570 Cal.) Piled high with hand-seasoned, hickory-smoked Texas Beef Brisket. (510 Cal.) Roasted, pulled chicken tossed in Rich & Sassy® and topped with melted Monterey Jack cheese. (470 Cal.) Rich and creamy banana pudding with slices of fresh bananas and vanilla wafers. Topped with whipped cream. (570 Cal.) Scratch-made with Granny Smith apples, served with vanilla ice cream. (1390 Cal.) 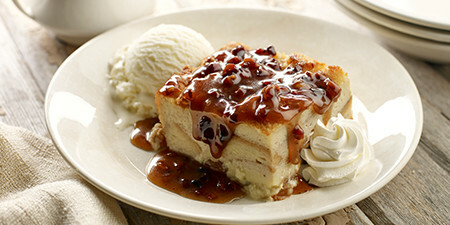 Scratch-made bread pudding and pecan praline sauce served warm with vanilla ice cream and whipped cream. (1190 Cal.) Walnut-covered chocolate brownie soaked with Kahlúa liqueur and topped with vanilla ice cream, hot fudge and whipped cream. (1040/1070 Cal.) Vanilla ice cream drizzled with hot fudge or pecan praline sauce and topped with whipped cream. ***Consuming raw or undercooked meats, or seafood may increase your risk of foodborne illness.